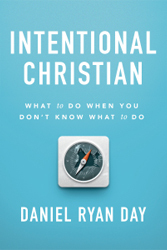 Daniel Ryan Day is a co-host of the nationally syndicated radio program Discover the Word, the author of Ten Days Without and Intentional Christian, a speaker and the General Manager of Asheville’s Fun Depot. He also holds a maser’s degree in Theology from Fuller Theological Seminary. He’s married to his high school sweetheart, Rebecca, and they live in North Carolina, with their three kiddos.